Carol Steen 19 janvier 2013 13 décembre 2016 Volume 11, Automne 2012. Neurosciences, arts et littérature. Abstract : In this paper I examine the processes and outcomes of using synesthesia in art. I discuss what might be different about artists with synesthesia and look at some types of experiences that synesthetes may have. I explore Heinrich Klüver’s Form Constants that can be found in the artworks of synesthetic artists. While Klüver discovered that synesthetes see things in common, I observe how they can be used in painting and also show what some common forms look like in video. Synesthesia shapes and informs one’s aesthetic, as well as contributes to the artistic process, even when one is unaware of one’s shared abilities. Because integrating one’s abilities into one’s work can invite challenges I discuss the impact that the art world can make. I also discuss how knowledge about synesthesia, or the lack of it, contributes to an artist’s work and an audience’s reaction to their artwork. 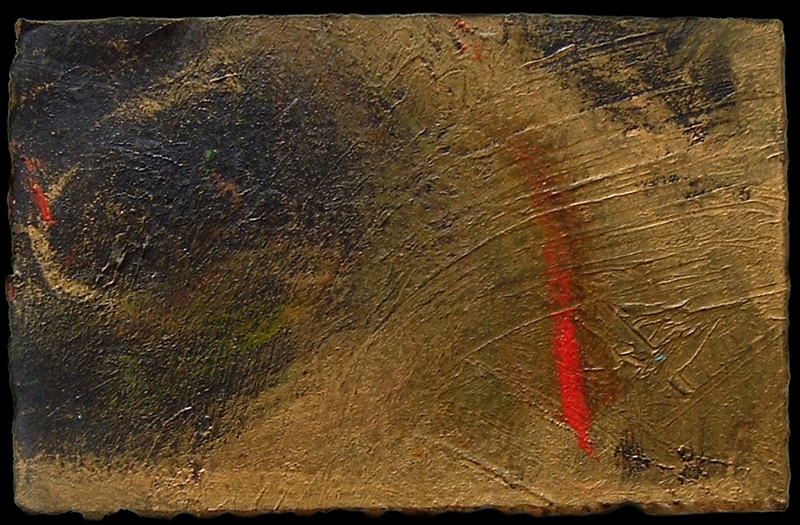 To illustrate these perceptions, he created a code of symbols so he could put his sounds and emotions in his paintings. But he never knew his joined senses had a name, synesthesia. There are stories about some synesthetes who were shunned when they blurted out their secret perceptions – as it is said that van Gogh was by his piano teacher. Others were diagnosed as being almost mad. A few lucky ones, like Kandinsky, knew that they were not alone and that their joined perceptions had a name so they were free to explore their experiences. The Swiss painter and animator Charles Blanc-Gatti, talked about it with the French composer and synesthete, Olivier Messiaen. But until recently, few synesthetic artists knew that evidence of their synesthesia often appeared in their artworks. 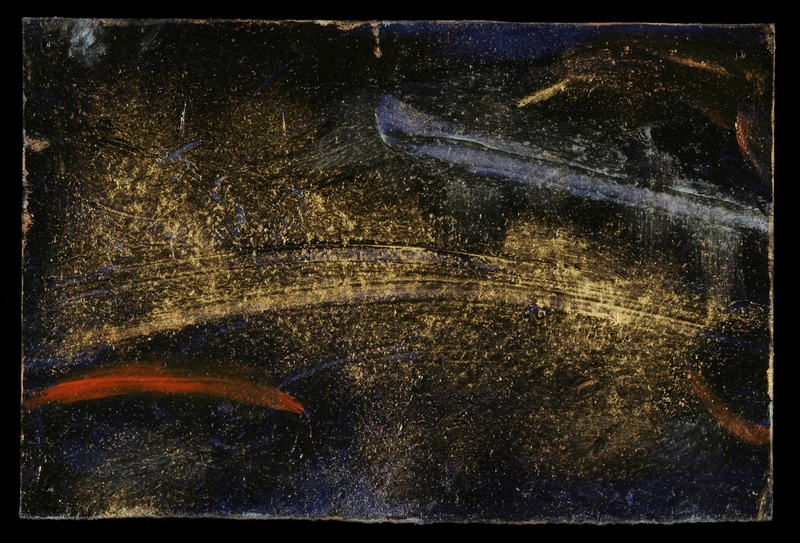 Though there was some awareness of synesthesia in European artistic circles between 1880 and 1925 and later, it is only now being intensively studied worldwide; research is still in its infancy. However, we do know that synesthesia is a normal, real, perceptional ability that is marked by unexpected joinings of the senses. Synesthetes see the world differently but they are not crazy or making it up. Their perceptions are not an association; their stories are not descriptive metaphors. But rather, they are real and demonstrable, as has been shown through the use of fMRI brain scans. According to current statistics, approximately four per cent of the population has one or more of the over 60 forms and (it appears to be genetic). Some common ­types include colored graphemes, colored days of the week, colored months of the year, and colored sounds. Rarer ones include scents that have sounds, or words that have flavors. For many synesthetes, letters, numbers and words have colors; they read in Technicolor. Some remember people’s names by the color of the first letter of their name; the colors replace their alphabet and became the ‘directory’ where names are stored by color in their memories. Sounds, both musical and non-musical, can have colors too, though some synesthetes might see the color of the timbre of the instrument. For others the sound of the piano might be pink or a violin’s sound might be orange. Others know the color of the note, C# might be green. While some synesthetes actually see the colors, most know the triggered colors in their “mind’s eye”. Another synesthete, with smell to sound synesthesia, created perfumes that caused her to hear chords of music; each individual scent was a note, and the combination of many scents, as happens in a complex perfume, created chords. Of the over 60 known forms of synesthesia, some let one see visions that can be very inspirational; particular sounds or touch sensations can appear as beautiful colorful, moving shapes. Although some forms of synesthesia show moving shapes, not all forms do. Current research has not yet explored this in any depth. I have been aware of my synesthesia since I was 7 years old and made the mistake of telling a school friend, on our walk home one October day, that my letter “A” was the prettiest pink I had ever seen. I didn’t know then that colored letters, numbers and words were perceptions not everyone shared so I was profoundly surprised by my friend’s curt, dismissive reaction. Her comment, “You’re weird!” caused me to remain silent about my joined senses until I was twenty. But though I didn’t speak about my abilities I continued to read and do math in Technicolor. I was aware that I had other forms but I tried to ignore seeing the suspended, lambent colored fragrances of my mother’s perfumes or the musical sounds that showed themselves as moving, morphing, colored shapes that appeared at times like ribbons of color which could turn back on themselves before vanishing when the record stopped playing. As I later discovered, I am like many other synesthetic artists in that my abilities are always present. But unbeknownst to me evidence of my photisms, as the scientists call the visions we synesthetes see, strongly informed and shaped my aesthetic. They appear everywhere in my artworks. Many people have a lot of questions about what photisms really look like. One reason for this is that very few synesthetes have been able to accurately show what they see. Another reason is that since few artists know that their photisms and works have commonalities, it has been very difficult for them to share their stories (and get confirmation). In fact, researchers have long wondered if synesthetes actually see the same things. In the 1920’s, Heinrich Klüver, an experimental psychologist at the University of Chicago, studied the synesthetic perceptions of people who had taken hallucinogenic drugs. He listened to their descriptions, but wondered if everyone saw the same things. As wonderful as words can be, they can also be easily misunderstood when describing something visual, so he asked his subjects to draw what they saw. Through their drawings he discovered that individuals experiencing synesthesia shared some common perceptions that he called ‘Form Constants’. Heinrich Klüver’s Form Constants, pen and ink drawing on paper, in Mardi J. Horowitz, 1970, Image Formation and Cognition. NY: Appleton Century Crofts, p. 216. You can see from this illustration that there are some basic shapes and configurations. But these drawings of the commonly seen synesthetic shapes are hard edged and sharply drawn; what you are looking at are really just linear, skeletal diagrams of what we synesthetes see. I have observed and worked with my synesthetic photisms for years now, and have seen the form constants Klüver documented many, many times. In addition to his list I have noticed other things that I take into account when I create from my synesthesia. 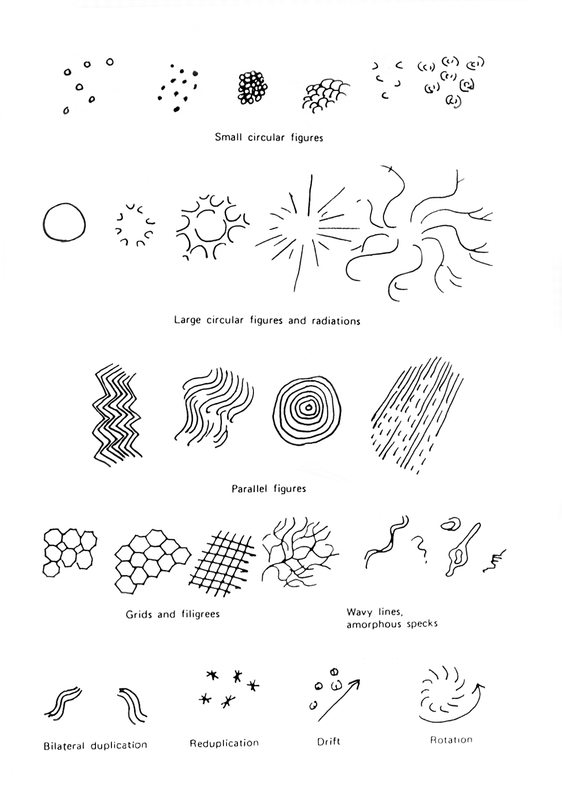 Klüver’s list mentions shapes that include: small circular figures, radiations, parallel figures, wavy or angular lines, amorphous specks, bilateral duplication, reduplication, central radiation, and radial symmetry. He also indicated that these shapes can move in certain ways: scintillation, spiraling, rotation, and drift. The background on which I see my visions is important. It is usually black, or white. Rarely is it a specific color. It moves, has texture, and when colored shapes form on top of it, they tend to move separately from the background on which they appear. When I permit the background to show in my works, I call these empty spaces visual ‘holes’. These intentionally left unpainted areas in the picture make reference to what was going on in the background during a vision. Black Rainbow refers to the layers of colors I saw during the placement of acupuncture needles one day. As they were inserted I noticed they went through different colored layers until the right place was determined. I painted the colors at the top of the visible black background as soon as I returned to my studio. You will also notice that in a few places the same colors started to appear on top of the black when all the needles were in place. Synesthetic colors appear bright and luminous like the colors of light seen on one’s computer monitor. These are colors of light and are much brighter than any colors printed on paper or cloth. They can also be metallic, opalescent, and textured like silk velvet or like the soft escaping bubbles in a glass of beer. Synesthetically, I see many colors, but I do not see all the colors of the spectrum. For me, purple is almost always missing, so I tend not to use it when I paint. Because I do not see it in a vision, I do not understand it. In addition, I often see unexpected colors and color combinations. The colored shapes on top will often softly blend into the background colors along their edges. Red Streak was seen after I received a flu injection; a red slash of color moved on top of the gold. The trigger for this visual was the pain of the shot. Everything I was watching vanished once the pain stopped, and I ran home to paint. The colors occur as shapes. They can appear instantly and move randomly as if in slow motion, a movie seen in the mind’s eye. No synesthete has said they can control what they see, make the visions stay longer, or make them go away. The best we can do is to try to ignore any that are ugly or that make us feel uncomfortable. The shapes I see are numerous, but not unlimited. They tend to be simple and soft edged: lines, streaks, zigzags, biomorphic, and blobs. I see straight lines but they are never geometrically precise. I often see concentric shapes, like circles and ovals. All of these are three-dimensional and exist in space but have no shadows. 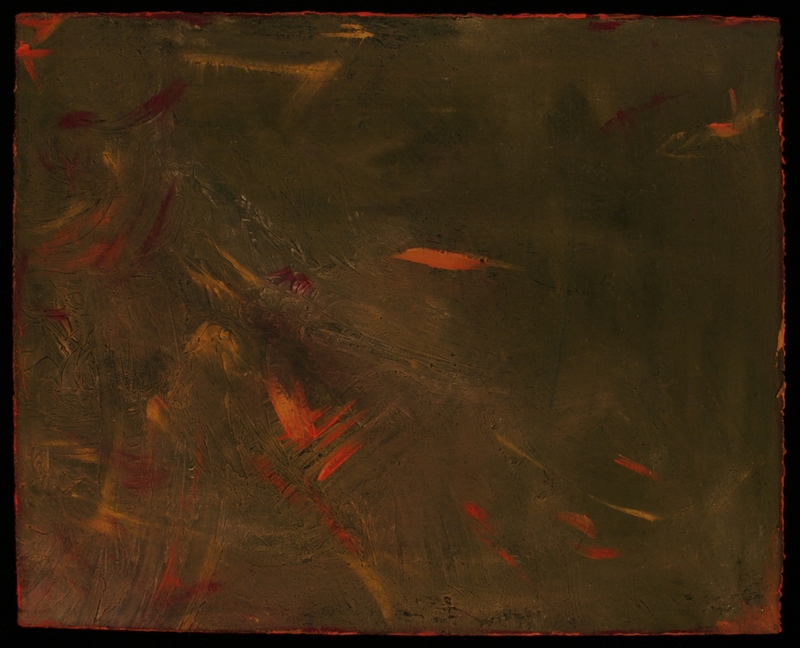 Orange Rising was one of the most recent paintings I did from recorded music. 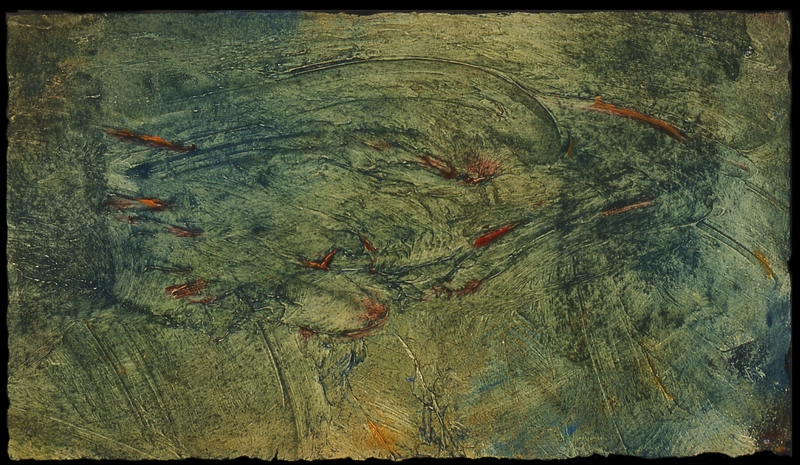 I was interested in the orange and red moving shapes that appeared suddenly on top of the greenish brown background layer I had been watching. Shapes can occur in layers, and these can move independently from each other. They can change arbitrarily: color, size, form, location, and they can form anywhere on the visual background. They can also vanish unexpectedly and instantly, or dissolve gradually, or morph into a new shape that may or may not be closely related to the previous shape. The shapes also have textures. We synesthetes agree, regardless of the trigger, that sometimes the seen colors are translucent like a light haze of smoke or a dense patch of fog. Sometimes they have a weight that seems almost physical. At times, they can feel very soft and inviting. My synesthetic perceptions do not cause me to see things exactly the same way every single time. While I do not know the reasons for this, I believe that some of it is due to my attention, what I single out at any particular time, such as the flutes, the drums, or the violins in a song. If I change my focus, my colored shapes change too. In some of the diagrams, Klüver’s form constants appear symmetrical. I have observed that the only times I have ever seen symmetrical shapes are when I am under the influence of nitrous oxide in the dentist’s chair. For me, the visions are triggered by the sensations of touch and pain; they are only amplified by the gas. The nitrous oxide itself does not cause me to see any synesthetic visions. I’ve noticed that single or multiple shapes can move in an ordered way, but they can also move arbitrarily in different geographies like asteroids in the solar system. I have no idea why they change as they do. When shapes move in an ordered sort of way, I notice that sometimes their movements are linear, from top to bottom, side to side, or from large to small. The timing of the shapes’ movements varies too. I’ve seen some visions last as long as 10 seconds, but usually the viewing time is only enough to observe them, but not to memorize all the details of what I’ve seen. Sometimes, only a single shape will appear like an unexpected overlying slash of color. The speed of these moving shapes can be gentle. The speed of their movement depends on the stimulus. With music, it seems to be linked to the tempo. A change in the instrument or note heard, a shift between bass and treble, a transition from major to minor keys, or a change in who is playing the same song, can also affect what one sees. Water Blue is full of moving red shapes that traveled together rather quickly in a circular direction starting from the upper right. I watched them move off toward the left side of what I could see and disappear. At the same time, the blue background was also moving. In just this past year, I have had a series of visions during an acupuncture treatment. Then, like an instant replay, the same series of visuals will appear again and again as if someone really wants me to remember what I’ve been watching. This happens when I’m lying on a futon in a darkened room, a blindfold covers my eyes, I’m stuck full of pins, and listening to various songs that do not repeat. Because the music does not repeat I rule it out as the reason for why the visions do. Once my acupuncturist, Robbee Fian, begins to remove the needles, whatever vision I’m watching will freeze, then fade as more and more needles are removed. When all the needles have been taken out, all that remains is a static black background. When I undergo a subsequent treatment for the same condition, I usually do not see identically recurrent images, but I will recognize familiar shapes, colors, and movements. A different placement of needles, to treat an unfamiliar complaint, lets me see new colors, ones I’ve never seen before in acupuncture. In the same way, listening to a new genre of music, one I normally don’t listen to, elicits for me different colors. 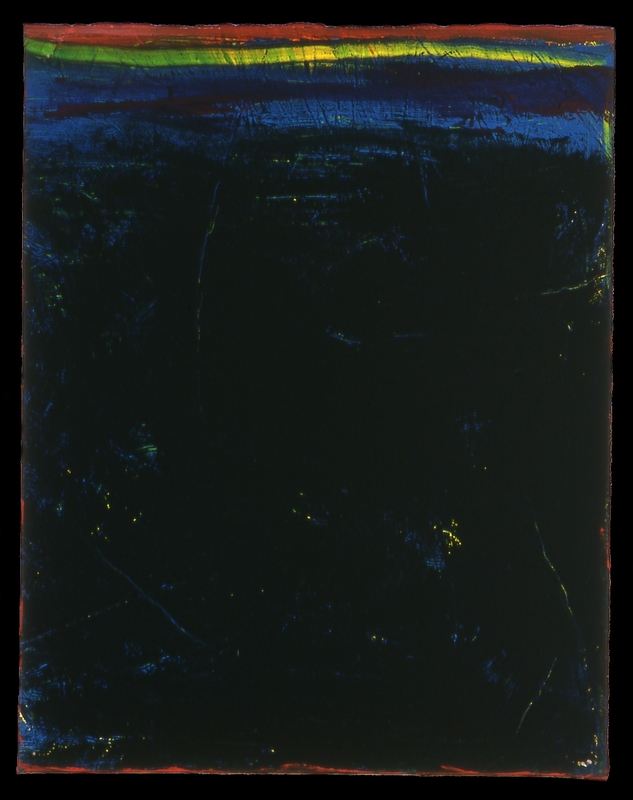 When I was first interested in identifying the common elements that synesthetic painters see and put into our art, I looked closely at my own work. I was aware that I avoided working with my moving synesthetic images because there was no way that I could show any shapes moving as they actually do. Curiously, a few years ago I got an intriguing email from a young Hollywood director. He asked if I could paint what I saw during a 1-1/2 minute sound clip. He said he wanted to use what I saw for the opening credits of his documentary film. I soon realized that in order to create the video he wanted, I would have to explain to his animator, Chad Sikora, who is not synesthetic, what I had seen. He would need to understand several important things: When and how do the shapes appear, change, or vanish? Were they transparent or opaque? How long were they seen? Where did they go when they moved? What was the timing of their movements? As I had discovered Klüver’s commonalities in my still paintings and in those of other artists, I now returned to look at his form constants to see what he had found. When I began to work with Chad, I described, drew, diagramed, listed my observations about how visions moved, painted, and Photoshop-ed my synesthetic movements. I decided that it would also be helpful if he and I began simply. We animated a few of Klüver’s Form Constants. Although the trigger can affect movement, sometimes the way shapes move is arbitrary. I cannot positively identify exactly what is causing me to see what I see but I know that with music the tempo can affect the movement. However, this is not the case with acupuncture; and the trigger for photisms seen in acupuncture remains a mystery. While I have had similar visions and seen types of shapes many times, I believe there are both a limited number of different shapes, and types of movements. The colored, moving shapes seem more diverse because they appear in combination. For example, a single firework by itself is beautiful, but a lot of the same kinds of fireworks, seen together, are more interesting to watch. As the forms mingle, and appear to change, as the colors and shapes overlap, one notices other things – the whole vision becomes something far more complex and amazing. But seeing these combinations of shapes does not mean that new ways of movement have occurred. When shapes disappear, I’ve observed they can do so in any number of ways: They can change shape or color, fade gradually, stop, morph into a different shape, and change location on the ‘screen’ of my usually black background. They can move to the top, sides, or bottom, or stay where they are and vanish. And once they disappear, they’re gone. I have never been able to make any of them stay or come back once the needles are removed, or the music ceases. They’re like a one time visitor. If I could compare what I see synesthetically with things everyone can see in nature my visions would look somewhat like the Aurora Borealis, like the colorized photographs sent from the Hubble telescope, like combinations of fireworks, or like solar flares. Here are three videos that Chad Sikora and I made that begin by showing Klüver’s linear drawings, then illustrate how a synesthete might see that diagram, how the colored shapes move, where they go, and how long they last. Close to Purple Comma shows one of the simple, common forms we synesthetes see. When Klüver illustrated this form, it appeared as a single curved thin line. What I often see is a soft edged shape that, in this case, moves off to the upper right and disappears from view. Although in this video the shape is red violet I often see this comma shape in other colors. Red-Orange Concentrics When Klüver illustrated his parallel figures, such as concentric circles, he made linear drawings. However, what I see are color fields of red and orange with soft edges. Notice that the center circle does a surprising color change to blue. I do not know what causes the colors to change in a vision. Falling Emerald Greens Once, during acupuncture, in a particularly interesting vision I saw 3 columns of emerald green comma shaped forms fall slowly. The green shapes are not identical, they are soft edged, and a few have a bit of blue in them as well. When the needles were removed one by one, the green comma shapes froze in place and then slowly, they faded and vanished. The movements and timing of the falling commas are accurate to what I remember. Although the works of synesthetic artists have often been described as being abstract, the synesthetic artist sees what she creates as absolutely realistic. Indeed, synesthetes express what they experience, despite the fact that only they can see their visions. Many synesthetic artists have worked from sound, not only because it is one of the more commonly experienced forms of synesthesia, but also because it’s moving visuals are so rich. However, it is not the only synesthetic trigger that is available for use. Sometimes a painful touch experience, such as a Tetanus shot can produce an intense vision so beautiful that one is absolutely compelled to paint what is remembered. Blue Streak was just part of what I saw when I got the injection that day. I do not know when I get a vision from touch or pain what I will see. So far I have not been able to find any commonalities except to note that pain, for me, is usually orange; but it can be red at times, as well. When I use red or orange in a painting it is not always a sign that I have painted an unpleasant sensation because I see these colors at other times when no pain is involved. A common misconception is that synesthetes work from only one of their joined perceptions. For example, a sound will produce a vision of one or more moving colored shapes. But a synesthetic experience can also be a combination of multiple perceptions that occur at the same time. These join together to become one experience in the same way that a roof, windows and the front door become the image of a house. I remember once having had a toothache that let me know exactly which tooth was the sore one. I was aware that this tooth was surrounded by an indistinctly textured orange color that had the density of smoke. And at the same time I also tasted a bitter, black flavor and smelled a petroleum-like, sap green odor that no one else could smell. What I saw was not something that I wanted to paint, not because it was painful to remember but rather because the colors I saw were not beautiful. Artworks that feature moving, and colored shapes can be created from sensory triggers such as music, touch, or smell. They can also be created from non-sensory triggers such as the colors of letters or the personalities of shapes. Regardless of the trigger or triggers used, the commonalities of the types of shapes seen in photisms, as described by Klüver, appear to be the same. Like all artists, synesthetic artists can choose to create their works in any medium: paint, photography, sculpture, or animations depending on which aspects of a vision are most compelling and which medium best expresses what has been experienced. It is important to note that synesthetic artists do not merely copy what they see; in fact, they see far too many things to remember them all. Instead, artists must select which parts of a long vision are most important, and decide what is the best way to use them. However, even in a very brief photism, where things are seen for only a very short time, what an artist creates from the vision is largely dependent upon their memory. If one chooses to work to recorded music the option of replaying the music means that the artist doesn’t have to rely on memory and can consider many choices both during and after the creative work. Something seen but forgotten can be re-seen by replaying the music. It is important though that the synesthetic artist pay close attention to what is shown and try to capture it immediately for it may never be seen again in the same way. Working with synesthesia presents some challenges to artists, many of whom have been taught to work in a traditional way. In addition to learning generally accepted working practices and materials, preferred subject matter, and how to master expectations of technical prowess, artists are also taught to pay attention to and, often, expected to work within the styles of their time. Art history is full of stories of artists who went against the usual expectations and some, like Vincent van Gogh, who could not conform, suffered accordingly. Appreciation of their works had to wait until the times changed and a different aesthetic was accepted. The approval of one’s peers, and the art world, can be hugely influential on one’s artwork. For the synesthetic artist, to whom visions are very real, using them in art can be problematic because their photisms cannot be experienced directly by others; one cannot know if anyone else in the world will understand what they see. This difference in perception serves to isolate the synesthetic artist in several important ways: If seeing things others cannot see is thought to be a disorder in one’s culture what risk does the artist take to admit to ‘seeing things’? If people tend to like things that they know, what risk is taken to paint what one sees when others do not understand the visions? If one wishes to communicate what one experiences but one’s audience is unfamiliar with the concepts, how can they fully appreciate what the artist has created? Consequently, it is not uncommon for a synesthetic artist to be in denial about their synesthesia, to deprecate their abilities, or to be unaware of the fact that evidence of what they see both shapes their aesthetic and is usually quite visible in their work, if one knows what to look for. In fact, many artists, even today, while they have become aware of the concept of synesthesia remain unaware that they use what they see and that they are not alone; others can and do see what they see. No matter how a synesthetic artist may work to create their final artistic products, several issues remain: One is that the artist must be free to work from their sense of inherent aesthetic ‘rightness’ even if it is very hard to articulate. Another is that one must be able to share with their audience that synesthesia was used to create the works and believe that the audience will understand that synesthesia is both normal and harmless. The artist needs to know that often their aesthetic judgments and choices are made unconsciously based on what they see synesthetically; they use visions that are familiar and innately understood. Most importantly, the artist needs to know that they are not alone. They share commonalities in work, subject matter, color, shape choices, and movements with others who also see the world differently. Greta Berman, Synesthesia and the Arts, Boston, The MIT Press, Leonardo 32(1): 1999, p.15 – 22. Richard E. Cytowic, The Man Who Tasted Shapes, New York, New York: Jeremy P. Tarcher/Putnam, 1993. Mardi J. Horowitz, Image formation and cognition. New York: Appleton Century Crofts, 1970. Carol Steen, Visions Shared: A Firsthand Look into Synaesthesia and Art, Boston, The MIT Press, Leonardo 34(3): 2001, p.203 – 208. Carol Steen, Greta Berman, (In Print) The Oxford Handbook of Synaesthesia, Synaesthesia and the Artistic Process, Oxford University Press, UK, 2013, Chapter 34. J. Benjamin, Editor, Charles Burchfield’s Journals The Poetry of Place, State University of New York Press. 1993. Nancy Weekly, Ecstatic Light. New York, New York, 2007, D C Moore Gallery.